Pregnancy is a time of mixed feelings for any woman; on the one hand, she is all aglow with the joys of incumbent motherhood, and on the other, she has new restrictions imposed on her in a way she hasn’t known before. With a new life growing inside her, she has to be careful of her every move, and watch every bite she puts into her mouth. And justifiably so; everything that goes into the mother’s body is absorbed by the growing baby in her womb. In this article, let us take a look at the things an expecting mother can, and cannot, have during the different stages in her pregnancy. First, we’ll take a look at what a pregnant lady can eat during three different trimesters of pregnancy. This is the most delicate of the nine months. The baby is in its very early formative stage, and will be affected by every change you make to your system. So, it is best to ensure that everything you do can only benefit the baby, and keep your gynecologist on speed dial. Seek consultation for the smallest doubts. Here’s what you can munch upon in the first three months of motherhood. 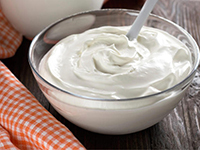 Yogurt: The growing baby is going to need a lot of calcium and Vitamin D, which means you will need it too. Make sure you have enough of this during the day. Breakfast is a good time of the day to have some yogurt. Apart from giving you the necessary calcium to keep your bones strong, it might also help with the morning sickness that usually sets in with the first month into the pregnancy. Add it to a couple of cups of oats, and throw in some honey and a few pieces of your favorite fruit, and you are good to go. Nuts: These power-packed seeds contain a lot of protein, and the pregnant woman needs a lot of protein to cope with the all the changes her body is going through. Mix and match with a variety of nuts. If eating them by the handful sounds boring, mix them in your ice cream or your cereal. Make a trail mix of nuts, seeds, and dried fruits and you will have something yummy to munch on all day. Green vegetables: Green vegetables are a great source of minerals and vitamins, and are rich in folate. Folate, or folic acid, is a necessary nutrient that helps in preventing neural birth defects in the baby, such as spinal cord issues like spina bifida. So, add a lot of these nutrients in your diet. Toss up a spinach and pea salad to carry to work, and make some yummy pea soup for breakfast. Sautee broccoli with other vegetables for dinner. This is something you will be including in your second and third trimester diets as well. Pasta and breads: The good news about pregnancy is that you can add back a lot of food that you avoided like the plague for your sliming diet. So, a moderate amount of pastas and breads will be back on the table, because these items contain ample amounts of folic acid. Try to make sure that you are taking whole wheat pastas and multigrain breads to cut down on the gluten intake as much as possible. Lentils: Lean protein is a must for a pregnant lady, and lentils are a great source for that. All kinds of lentils are good for health; however, keep in mind that excessive consumption might lead to uric acid accumulation, so it is best to consult your nutritionist for the recommended amount. Make a simple lentil soup, or a lentil burger. If that sounds too pedestrian, you can always look up foreign recipes for a bit of an exotic variation. Animal products: Meat and eggs are a great source of protein, and fish is the richest source of omega 3 fatty acids. Lean meat like chicken will give you the necessary protein and iron, and the fatty acids in fish will keep your cholesterol in check. Eggs, on the other hand, will give you calcium and vitamin D, so your baby will form strong bones. Once you are into the fourth month of your pregnancy, it will start to show quite visibly. Your morning sickness will have abated considerably, and the baby will have tiny fingers and toes. This is the time you need to load up on vitamin D, omega 3 oils, calcium, iron, and magnesium, because all of these will contribute to the development of the baby’s brain. Here are the foods that will help you get the necessary nutrients. Dried fruits: Dried fruits are a great source for calcium and iron, and a great way to keep the frequent hunger pangs at bay. Make a healthy mix of dried apricots, raisins, figs, and dates, with some dried coconut flakes thrown in. Chop them up and sprinkle them in your oats and yoghurt or ice-cream, or mix them into your trail mix. Dairy products: A balanced amount of dairy products, such as milk, cheese, and yogurt, will help in providing calcium to the growing bones and teeth of the baby, and keep you well supplied too. Take a glass of skimmed milk- full of magnesium and calcium- in the morning, or as a snack in between meals. Add some yogurt to your oats or fruits in the morning, or carry a cup of yogurt to work to snack upon. Avoid diary with very high fat content, and try to get organic products whenever possible. If you are lactose intolerant, you can substitute milk with soy milk and cheese. Variety of vegetables: Apart from leafy greens, this is the time to include all kinds of vegetables into your diet. Get ample carrots, beets, red and green peppers, and peas into the daily meals. Get more colors into the plate; that will ensure variety and a wide range of vitamins and minerals. Eat your vegetables either sautéed or steamed; cooking them for too long will get rid of most of the nutrients. Eat them as salads to get the most out of them, or make sandwiches. Nut butters: Nut butters are a great source of healthy fats, which will help you gain or lose the necessary weight and fight cholesterol deposition, and high amounts of magnesium and iron. Spread some peanut butter or almond butter on your wholegrain bread for a healthy breakfast. Canned sardines: Canned sardines are very rich in magnesium and iron, and they are necessary for the baby’s growth and the mother’s well-being. They also contain magnesium and omega 3 oils, which will help in the development of the baby’s brain. Sardines, along with a watercress salad, a healthy dose of vitamin C and calcium to your daily nutrient intake. Adding some pine nuts will add into the mix will also give you some iron. Seeds: Sunflower and pumpkin seeds are chock full of omega 3 fatty acids, magnesium, and iron. Pregnant women often begin to become deficient in iron during the second trimester, so it is necessary to ensure that you take iron externally to remain healthy. Iron intake will also help in forming red blood cells in the baby. Eat the seeds roasted, sprinkled on your oats and salads, or make a trail mix with raisins and roasted nuts for a great snack. The last three months of the pregnancy is marked by frequent visits to the doctors, thorough checkups, and very, very careful eating. By now, you are big, and the baby is almost fully grown. This is the time when you again have to be very careful of everything you eat and everything you do. Be particularly careful of allergies, from food or drugs, and make sure you consult your nutritionist before you change your diet. And make sure you have a little extra to have enough energy to function throughout the day. Yeast extract: Yeast extract contains thiamine, which helps in the growth of the heart and cardiovascular system of the baby. It will also help in regulating the circulation system in the mother, who is likely to face some blood pressure fluctuations during this time. Take yeast extract as a topping on toast or as a filling in sandwiches, along with a healthy smattering of vegetables and meat. Lean meats: Lean meats contain negligible fat content, which makes it the perfect meal for a pregnant woman. Chicken, lean bacon, and lean pork will act as an excellent source of necessary healthy fats and protein. Eat them as meals in themselves, or add them to salads and sandwiches. Make sure the meats are thoroughly cooked; even medium rare meats are a strict no-no during pregnancy. Small fish: Small fish are a great source of proteins and omega-3 fatty acids, which will help in developing the baby’s brain and eyes, and will regulate metabolism and circulation in the mother. Besides, smaller fish are easier to digest, and contains little to no mercury. Fresh fruits: Fruits contain vitamin C, which keeps your immune system healthy. At this stage of your pregnancy, you must be careful of your health all the time. Eat a lot of fleshy fruits such as kiwis, avocados, strawberries, and papaya. Slice them into a salad, or dip them into your yogurt and oats. They are rich in fiber as well, which makes them great as aids in digestion. They will also provide relief from constipation, which is a common issue at this stage in the pregnancy. It is best to eat them whole or sliced instead of juiced, and helps in the development of the placenta. Liquids: During the third trimester of the pregnancy, women are likely to face problems like dehydration and constipation. A regular intake of fluids will be able to tackle this problem quite efficiently. Make sure that you drink a lot of water, unsweetened juices, and decaffeinated beverages. Have some soup for dinner or as a snack. Healthy liquids help in boosting digestion and facilitating bowel movements. Undercooked or uncooked meat: Be it fish, meat, or eggs, it is best to avoid undercooked animal protein. There is a huge risk of contamination from salmonella and coliform bacteria that thrive in undercooked meat. Always cook well till no pink is visible. Eat overdone meat if required. Raw shellfish should also be avoided at all costs to mitigate infections from algae. Old meat: Meat that has been in the freezer for quite some time, such as from the supermarket or from the deli, is likely to host thriving colonies of listeria, which are known to induce miscarriages. Apart from this, listeria is known to be potentially life-threatening, both to the baby and to the mother, having been known to cross into the placenta and cause infections and blood poisoning. Unclean food and beverages: Fruits, vegetables, and meat that have not been washed thoroughly are host to toxoplasmos and salmonella and a plethora of other germs, all of which can be potentially fatal to the baby. It is imperative that all food be washed thoroughly, preferably in warm water, before they are cooked. Boil water before drinking, and make sure that all water storage devices are thoroughly cleaned on a regular basis. Street food is best avoided, and eat only at places where cleanliness is held in high regard. Large fish: While fish is good for the pregnant woman, it is best to limit consumption to one or two meals a day, and that too of small fish, such as salmon and tuna. Large fish such as shark and swordfish are known to contain high amounts of mercury, which can accumulate and lead to mercury poisoning in the mother, and developmental disorders in the child. Unpasteurized dairy: Drinking milk that is unpasteurized is highly harmful for the mother and the baby since it contains listeria. Only buy skimmed, pasteurized milk. In fact, make sure you boil all the milk that you consume. Apart from milk, soft cheeses such as Camembert and Gorgonzola are also host to listeria, so they should be avoided as well. Alcohol: All alcohol is barred for the pregnant woman. There is actually no safe limit, at any stage during the pregnancy. White or red wines, or beverages with the tiniest bit of alcohol content can be potentially harmful to the baby, leading to fetal alcohol syndrome and other developmental disorders. Caffeine: Experts are divided in opinion on this subject, but it is best to avoid caffeine altogether, or limit intake to less than 200 mgs per day if you must have some. Some studies show that caffeine intake might lead to miscarriage and premature birth, and even if it does not, caffeine leads to dehydration and loss of calcium. Narcotics: This goes without saying, but it is best to not consume anything in this category during pregnancy. It is not recommended at any point during one’s life, but tobacco and drugs of any kind can cause serous damage to the unborn fetus and the mother. Pre-natal narcotics and tobacco lead to sever developmental disorders in the child, and may lead to miscarriages and still-births. Morning sickness sets in some time during the first semester, and is probably the worst of the series of discomforts your body goes through. And while some mornings it might seem like you do nothing but retch, some foods can actually seem comparatively appetizing and make you feel a little less like death. Bedside snack: The nauseous feeling sometimes set in as soon as you open your eyes. To battle this, make it a habit of putting a bit of cracker or a dry cereal in your mouth as soon as you wake up. Whatever it is, it must not have a very strong taste. The taste should preferably be mild. Don’t go hungry: Morning sickness usually goes away as the day progresses, but in order to mitigate its chances of returning the next day, have small and frequent meals. Eat something that is slightly bland in taste, but tastes good nonetheless. Salads with vegetables, whole grain bread, and soups are good at battling nausea. Make them in batches to have some handy at regular intervals. Plenty of fluids: Fluids keep the body hydrated, and keep down the tendency to throw up. If you are feeling too nauseous, try taking a sip or two of water. Drink plenty of water and unsweetened fruit juices throughout the day. Avoid taking water during meals, but make sure to take a couple of sips before and after. Light food: Do not what anything that is too heavy. Avoid food with pungent cheeses or fish. Anything too oily will only make your nausea worse, so avoid takeout. Garlic and onion will probably not help you with the nausea, and eggs might make it worse. In fact, it is best to let somebody else take over the cooking for the first trimester. Fresh fruits and vegetables: There is nothing lighter and more filling than a great salad. Raw and well washed fresh fruits and vegetables, like carrots, beets, radishes, and oranges, can be turned into great salads. Opt for food with vitamin B6 as it helps keep down the lightheadedness and vomiting. Asparagus is good for pregnancy, but you should probably avoid it until the second trimester. Instant relief: Sometimes, the nausea will set in when you are at work. To deal with such situations, keep a sliced lemon handy in a zip lock bag. The smell is fresh, and sucking on it works like a miracle. Peppermint tea is also a great antidote for nausea, as is ginger and fruit-flavored popsicles. Keep some on yourself for times when you have an overwhelming urge to throw up. Life doesn’t stop when you are pregnant. Baby showers aside, there are birthdays, weddings, and farewells. There are ample occasions when you have to go out and meet people, in social occasions with plenty of good food and drinks. Things will be different during those nine months, but that doesn’t mean you cannot have fun with your options. Low-calorie snacks: Parties are not likely to stock up on oily, greasy food. So that is a great plus point. You can curb your frequent hunger pangs by sampling the healthy snacks, such as tea sandwiches and other finger foods. If possible, inform the host beforehand, so they can have some special snacks ready for you. If that is not possible, carry a bag of trail mix and crackers in your purse. Stay hydrated: This is a must. It is absolutely imperative that you drink plenty of water while you are at the party. This might make you a little more incontinent, but not drinking ware will dehydrate you, and that is not good, what with all the talking and socializing. Avoid the danger zones: Do not eat anything that might be undercooked, like rare meats and fish, or anything with raw eggs in it. Avoid alcohol even though it is practically customary to have a glass in your hand. If it is absolutely imperative, take a glass of wine. However, to be on the safe side, drinking more than a sip or two is not advisable. And last but not the least, smoking is a strict no. No matter how much food you are taking in, it will still be impossible to maintain all the necessary nutrients with food alone. Include iron, vitamin, and mineral supplements in your diet. But remember to consult the physician before you buy any; not everything is for everyone, and the bodily changes during pregnancy might make previously safe options unsuitable. Take folic acid supplements, which is a must, along with vitamin C, iron, magnesium, calcium, and vitamin D.
Maintaining a balance is key to staying healthy during pregnancy. Include healthy amounts of carbohydrates, proteins, vitamins, and minerals into your diet. Include lot of fluids, and get the appropriate exercise as well. Do not omit fats from your diet either; the weight-watching can wait till after he baby is born. Take note of the changes in your weight; if you gain or lose too much, consult your doctor immediately. Above all, stay happy, stay relaxed, and wait for the first time you lay eyes upon your beautiful child.